After you have prepped your hull and installed a new primer. Fill with 12 grains of Alliant 2400 powder. A clean work station is a "Must" when reloading! DO NOT COMPRESS OR OVER-CRIMP. Great round for bunnies, roos, , coyote or midnight prowler. Can you tell me what diameter you use of round balls? 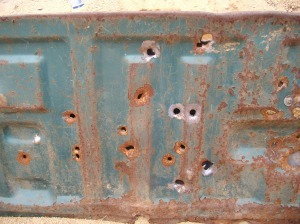 I have found molds for .395 and a .40,(that states “measures .395). I also see you mention a .410 diameter, do you have a mold in this? I found a special order mold from RCBS in .410. Another question, If you have tried these different diameters, which gives the best accuracy? I would assume the .410 since it will actually make contact with the barrel walls. I get my .410 roundballs from http://www.trackofthewolf.com as I do not have the RCBS mold. I have found the .395 light game slug from Midway to be very accurate http://www.midwayusa.com/product/177832/gualandi-light-game-shotshell-slug-410-bore-93-grain-lead-wad-bag-of-25 . The .410 roundballs are very accurate if you do not drive them too fast.Use a “Bore stump” wad/ 1/2″ fiber wads from http://www.ballisticproducts.com . Before you load this slug take a few and roll them around between two sheets of 220 grit sandpaper that are tacked to a smooth surface. The imperfections from casting will be removed. Be careful when you roll-crimp them as they will fill the mouth of your shotshell and if not careful you will score the lead with your roll crimp. Have Fun! Thanks for the information. It is very helpful. The .410 round balls are very reasonably priced at Track of the Wolf, thank you for the link. The RCBS .410 molt is over $100 so I would have to do a lot of shooting to justify the mold at that price. 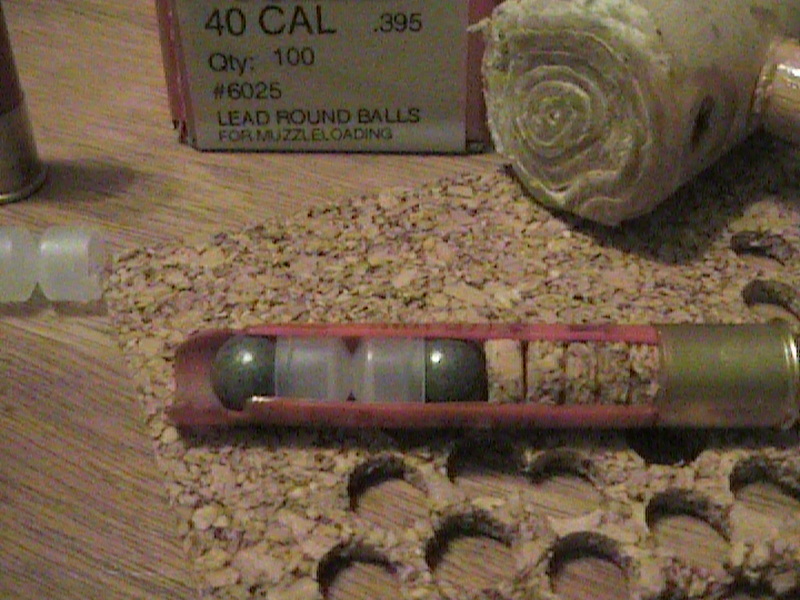 I find this very interesting as an economical slug load…..which brings me to the possibility of using a 2 1/2 inch 410 Fiocchi (or somesuch)….dump the pellets….insert some filler wad over the powder sealing plastic wad…load one 40 cal ball and roll crimp. May have to trim the hull to size the length. And same general theme for a 3 inch and two balls. If the ball weight remains within the weight of the original shot load, things should not go south, or not? As working with the 410 is described as picky, has anyone come up with a simple shell testing device using a converted something capable of dealing with high pressure. What system does the serious load developer use? I have an h&r survivor 410 love this gun. I shoot a lot of pyrodex rs loads for my h&r 12ga. I could use some good 410 pyrodex rs loads for this shotgun. (round ball or…) I clean my gun well after using. I would just like some good loads please. thank you aall for your time. Did did you have any luck finding pyrodex rs loads for your 410? I am also looking for the same info. I do round ball loads all the time with pyrodex or real black powder home made…. Remember the basic simple rule of thumb for BP shotshell loads. 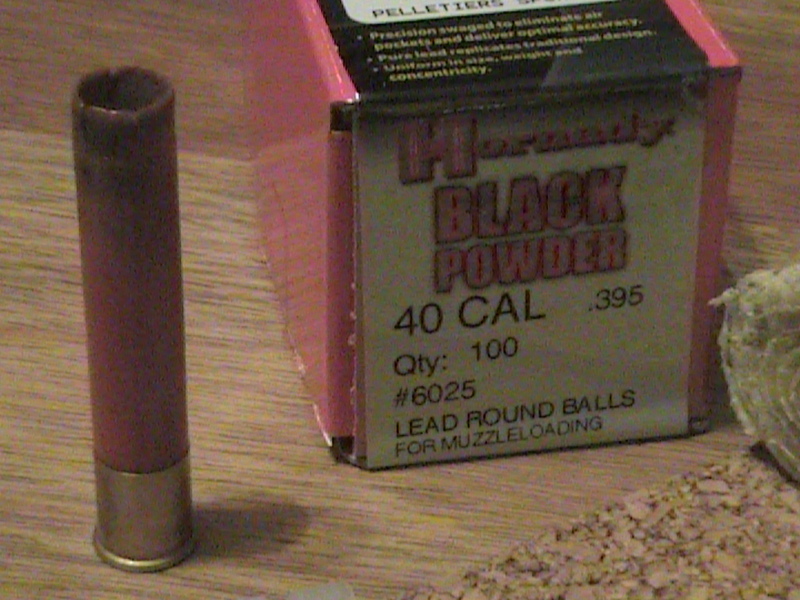 same amount of powder by volume as the shot you are shooting,,, so… Weigh your round ball and convert to Oz however you need to and then you can use a basic black powder scoop that has volume weight measurements stamped right on it… Use the indicated amount of PB or pyrodex, and compress the load with your fiber wad or nitro card then fiber, whoever you choose…. Just remember, that you do not want ANY airspace between the powder and however you seal the powder… So make sure the you use a bit of pressure until you are sure everything is bottomed out. Also, one thing I have found with the mag tech 410 brass and pyrodex, pyrodex is very hard to ignite… Even with a magnum large pistol primer I sometimes get failure to fire, unless I use a tiny bit of black powder closest to the primer before I pour the powder….. Of course I do all my black powder stuff with shotguns that are single shot guns… Barrel comes off easily and cleans quick… Especially if you lube your fiber wads before you load them with lube. 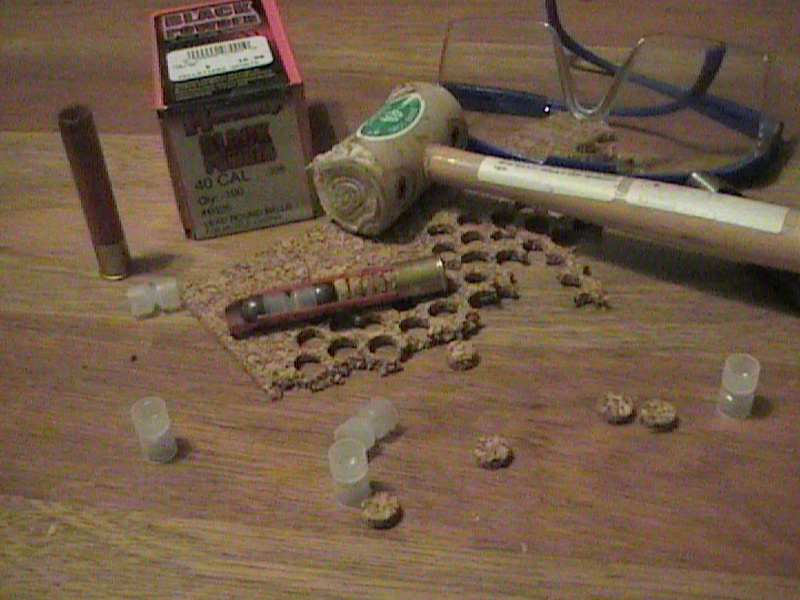 Also, I clean my mag tech shells in the same manner as I clean my barrel, and they remain shiney…. 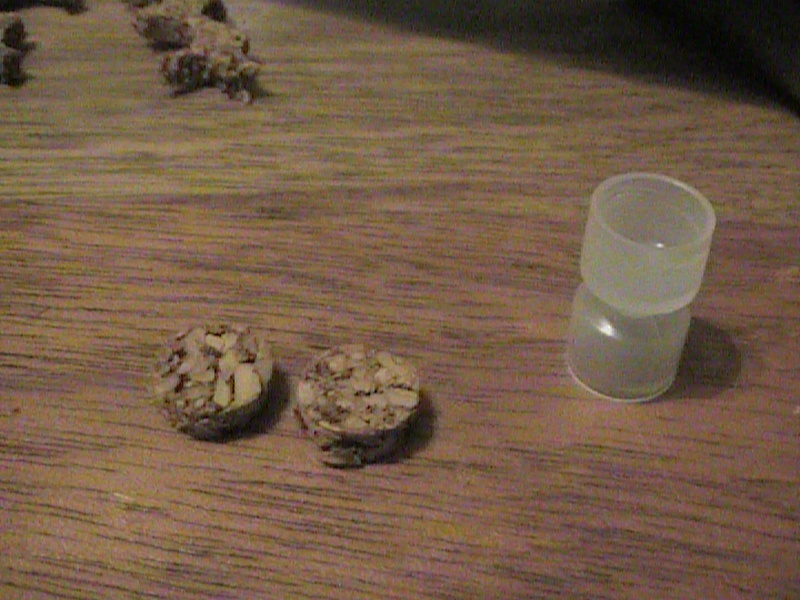 Also, I roll crimp the end of my shells after I place my over shot card… No glue, duco, or mess…. I use a crimp die in my reloading press to achieve a small crimp it holds everything in place very well…. I punch wads and nitro cards with a harbor freight press…..
Heah Mark, I am going to try this one! Have you ever tried using the 41 semi-wadcutter?